Size of Male: 29-66 lbs., 23-28 in. Size of Female: 29-66 lbs., 23-28 in. The Saluki dog is one of the oldest of all breeds. They have been known in the deserts of Arabia for thousands of years. This dog breed is very intelligent and somewhat sensitive but like many of the sighthounds they do not respond well to harsh training techniques. They can be good family dogs but they often bond very closely to one person. They may be aloof at times, even with family members. These are gentle, friendly dogs and they are very loyal. They are usually good with children as long as the children aren’t too rough. 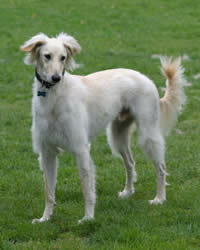 The Saluki dog is an ancient breed. According to DNA evidence they are one of the oldest of all breeds. They are depicted in drawings in Egyptian tombs and have been used by bedouins in the Arabian desert to hunt gazelle, jackals and hare for thousands of years. In the desert these dogs are highly esteemed and allowed to sleep in the tents of their masters – something that no other dog is allowed to do. Called the “royal dog of Egypt,” in Egypt they were mummified and buried alongside Pharaohs. Similar dogs appear on drawings from Sumerian tombs dating back to 7000 BC. Salukis were not imported into England until 1840. The English used them to hunt hare. These dogs did not begin to be popular in Britain until around 1895. The breed was first recognized by the AKC in 1927. The Saluki dog is somewhat independent in temperament, especially for a dog. In some ways they are like a cat. They can be aloof, even to their family members. Otherwise they are gentle, calm dogs. They are intelligent dogs and dog training is possible, but it may take a great deal of effort on an owner’s part to work with them since they do like to think for themselves. Salukis are first and foremost hunters so they should not be trusted with other family pets, especially small pets such as cats, rabbits, gerbils, hamsters and the like. They will look upon these other animals as prey unless you spend a lot of time training them. Even then you should not consider these pets safe around your dog. This dog breed is good with children. They may appear fragile but they really have great strength and endurance. Living Environment – Saluki dogs must have a fenced yard, preferably with a high fence. They are very athletic dogs and they can easily jump many standard fences, especially if there is something they perceive as prey on the other side. This Gazelle Hound, Persian Greyhound or Arabian Hound, as they are also knonwn, prefers to live indoors with their people. As a breed they have long enjoyed special privileges and have been kept close to people and not kenneled. However, these dogs are not really recommended for apartment living. They prefer warm temperatures over cold ones. Grooming – The Saluki dog may be either smooth or have some feathering on their legs. In either case grooming these dogs is not difficult. They tend to be very clean dogs. They should be brushed weekly and have an occasional bath. They shed little. Diet & Exercise – The Saluki dog has normal dietary requirements. They do need a great deal of daily exercise. They require a place to run but they should never be allowed off leash unless they are in a secured area. They can run at speeds around 40 miles per hour and if running free they may become distracted by an animal and pursue it. When exercising your dog, make sure he is in an area where it is safe for him to run. Otherwise he could be hit by a car and killed, or become lost. Your dog will most likely NOT return to you when you call him if he is pursuing something. You may wish to consider exercising your dog by taking him along with you on bike rides, with him leashed or attached to your bike. Health – Saluki dogs can be prone to some genetic eye problems. They can also be at risk for some forms of cancer. If you are interested in owning this dog breed you should talk to a breeder about dog health problems in their dogs. The Saluki dog is a very intelligent breed and they can be trained. However, these dogs are somewhat independent so you will need to be very persistent with your dog training. These dogs can get bored with training, especially if it is repetitive. Try to find ways to be creative with your dog training. The Saluki also does not do well with harsh forms of dog training. Use positive dog training methods (praise, rewards) and you will probably have better success.